Mercedes expects to sell up to 20,000 units a year of the GLK class in the US. SANTA BARBARA, California -- With an entry price under $35,000 (about 26,246), Mercedes-Benz expects its new GLK class premium medium SUV to have a competitive edge in the US over four new competitors due later this year. Early this month the 2010 GLK class goes on sale in the US as the fourth and smallest vehicle in Mercedes SUV/crossover line. 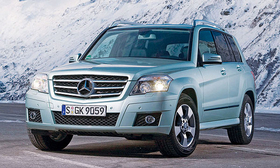 The GLK class has been on sale in Europe since June 2008 with a starting price of 40,341 including tax in Germany. Mercedes declined to give a sales forecast for the vehicle. But Ernst Lieb, CEO of Mercedes-Benz USA said at a press event here that it makes little sense to import a vehicle without sales of at least 15,000 to 20,000 annually because of the cost of maintaining spare parts. Through October, Mercedes has sold 2,951 GLK class units in Europe, according to market researcher JATO Dynamics. Lieb said the US is expected to account for 35 percent to 40 percent of GLK classs worldwide sales. The GLK class is entering a segment that Mercedes-Benz expects will grow to just under 140,000 units annually in the US by 2010 -- a 72 percent leap from 2007 sales, said Bernhard Glaser, general manager for product management. This year, four GLK class rivals will go on sale -- the Audi Q5, Lexus RX350 replacement, Volvo XC60 and Cadillac SRX. Mercedes pricing of $34,775 for the GLK class undercuts the BMW X3, which has a base of $40,225. Both prices include shipping. Mercedes-Benz expects the GLK class to be an entry point into the brand, said Glaser.